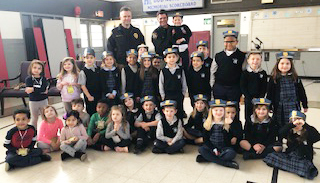 As part of Catholic Schools Week, Holy Rosary Regional Catholic School in Plymouth Meeting honored two Plymouth Township police officers and Plymouth Township Fire Marshall Andy Mount on Jan. 28, 2019, commending them for their contributions to safety and civic education. The three honorees were surprised by an assembly of students as part of Community Day of Catholic Schools Week, which ran from Jan. 27 to Feb. 2. The “Community Safety Assembly of Gratitude” celebration featured performances of the national anthem as well as “God Bless America,” “America the Beautiful” and “God Bless the U.S.A.” Several students shared their essays on what they think about police officers and firefighters. In particular, the event lauded Officers Mark Lacy and David Phillips along with Fire Marshall Mount for their diligent efforts to keep Holy Rosary compliant with safety requirements. The officials have provided the school with inspections and have instructed students on safety education, drills, and procedures in the event of a emergency.